The owl is a symbol of wisdom, truth, patience, foresight and knowledge, and a protector against harm. The perfect gift to inspire your friends or loved-ones to be more positive and to extend feelings of protection. 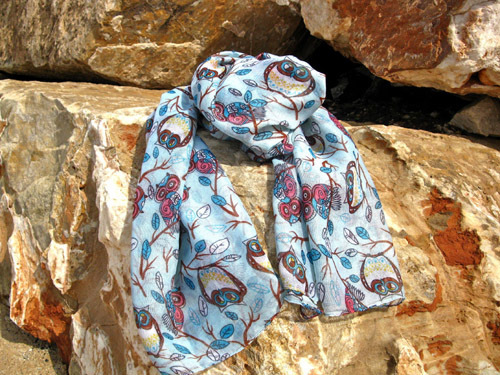 This lovely light blue scarf with pink and brown detail is great for all owl-lovers as well as girls or ladies who may be travelling, taking a gap year or starting a new venture. Detail: The scarf measures 180cms x 100cms and is made of viscose.